Each pupil should choose two sheets of origami paper.Both sheets will be folded in all of the activities. It is suggested that this topic should be given in two lessons. A discussion question: Which polygon shape is your sheet? Explain. Answer: The sheet is a square shape having 4 equal length sides and 4 right angles. A discussion question: Is it possible to fold the 2 square sheets into 4 congruent triangles using only 2 folds? 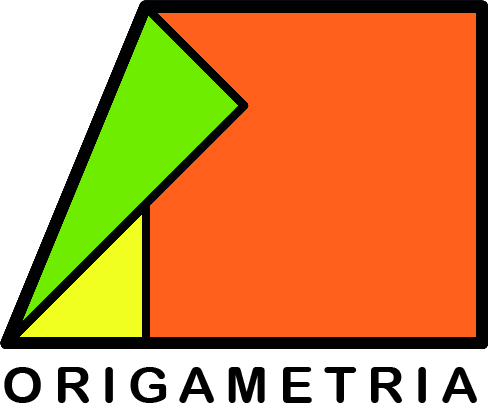 The pupils should give an explanation why the triangles are comgruent. Answer 1: In order to obtain 4 congruent triangles opposite vertices are folded on to each other and the sheets opened. Answer 2: Shapes are congruent when it is possible to completely cover each shape with the other. A discussion question: What can be stated about the two segments joining opposite vertices. Answer: The two segments are lines of symmetry of a square. This can be seen when the sheets are folded on these segments. Instructions:Mark the point of intersection for the two lines of reflective symmetry on both sheets.Put the squares onto each other, choose a common vertex on both squares and mark them. Mark these vertices on both sides of the squares. A discussion question: After putting the two squares on to each other and marking the common vertex and point of intersection put a pencil or pen on the point of intersection and turn the top square around until you finish a complete rotation. How many times during the rotation of the square did the two squares cover each other exactly? The question that should be discussed with the pupils concerns the direction of the rotation. Does it make a difference -clockwise or anticlockwise? In the animation one direction is shown so it is suggested that pupils try both directions. 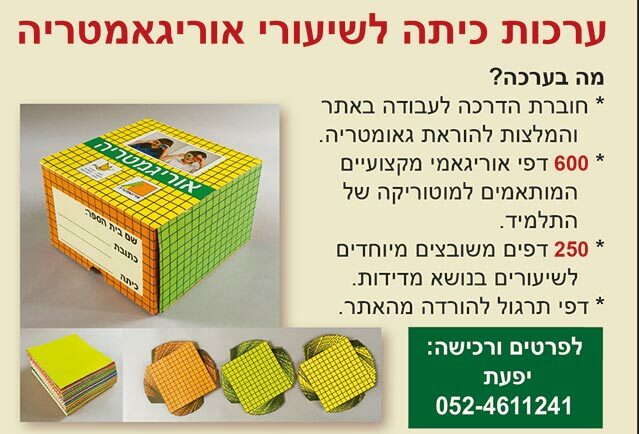 Answer: During the process of one complete rotation the top square covered the other square 4 times. A square has rotational symmetry of Order 4. Folding instructions: Fold the two adjacent sides of both squares at the marked vertex onto the line of symmetry as shown. Folding instructions: Fold and then open the white triangle on your shape. Folding instructions: Turn over both shapes. A discussion question: What is the special name of this shape? Answer: This quadrilateral is named a Kite. A kite has 2 adjacent pairs of sides of equal length. Remind the pupils that adjacent sides have a common vertex. A discussion question: Are both diagonals lines of reflective symmetry? Explain. Answer: Only one of the diagonals is a line of reflective symmetry.This can be seen by folding on this line to obtain 2 congruent triangles. The other diagonal is not a line of symmetry as can be seen by folding on this line. Folding instructions: Mark the the point of intersection of the diagonals on both kites. In the kite only one diagonal is a line of reflective symmetry. Ensure that the point of intersection is marked on the two kites. A discussion question: After putting the kites onto each other exactly and holding a pen or pencil on the marked point of intersection of the diagonals turn the top kite a complete rotation. How many times during the rotation of the top kite did the two kites cover each other exactly? Explain. Answer: A kite has rotational symmetry of Order 1. This really means that only after a complete rotation will the 2 kites cover each other exactly.As a result the kite shape does not have rotational symmetry. In several texts it is not stated that the kite has rotational symmetry of Order 1. Folding instructions: Fold each of the two smaller adjacent sides of the kites onto the line of symmetry as shown. A discussion question: What can you state about this shape? Explain. 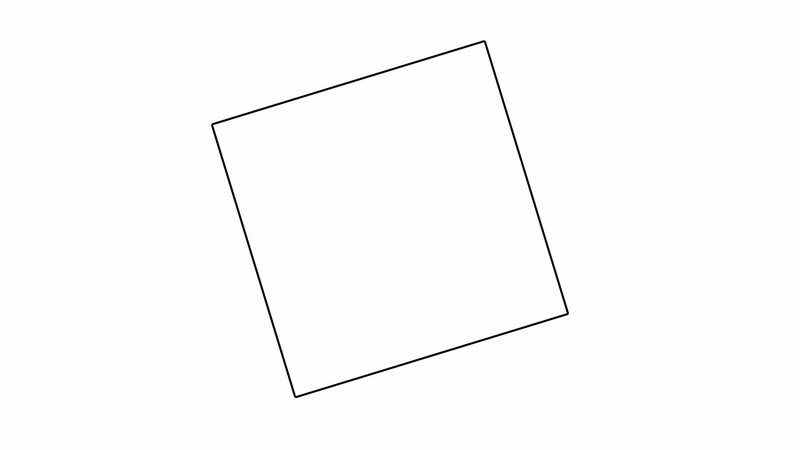 Answer: This new shape is named a Rhombus. All of the 4 sides are of equal length. A question: What can be stated about the 2 segments joining opposite vertices? Answer: These two diagonals are lines of reflective symmetry of the rhombus. This can be seen by folding on each diagonal to obtain congruent triangles. A discussion question: After marking a common vertex and the point of intersection of the diagonals on both shapes put each exactly shape onto the other. Put a pen or pencil on the point of intersection and rotate the top rhombus one complete rotation. How many times did the shapes exactly cover each other during the complete rotation? Explain. Answer: During the process of one complete rotation the top rhombus covered the other rhombus two times. A rhombus has rotational symmetry of Order 2. 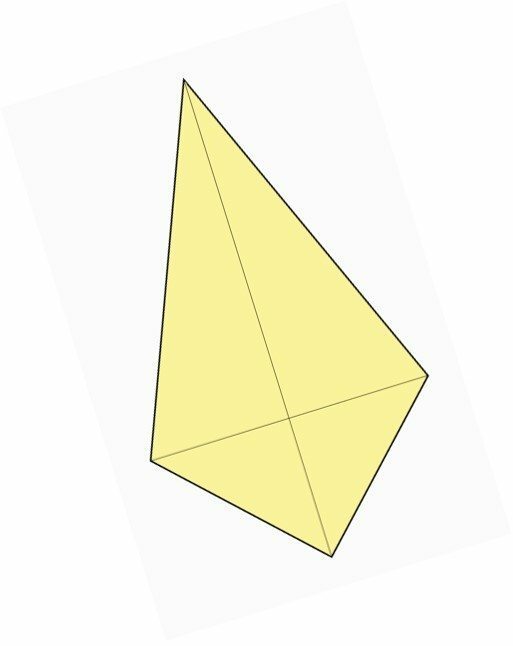 Folding instructions: Fold opposite vertices of the longer diagonal to obtain a triangle. 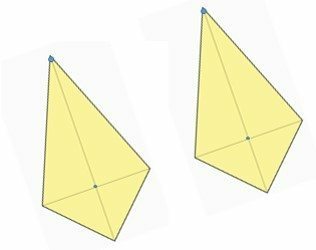 Folding instructions: Fold the 2 marked vertices of the triangle onto the line of symmetry of the triangle. Folding instructions: Fold the parallel sides of the pentagon shaped paper onto each other and turn over the shape. Folding instructions: Join the puppy head from the previous lesson onto your shape. The concepts of polygon and reflective symmetry. Origami square sheets 15 cm/15 cm and markers.